Ellen Shapiro's donation to the Carry On Campaign offered a choice: either her favorite movie of all time, or one of the worst movies she'd ever seen. Gratefully, I elect the former - there's plenty of rarefied crap still to come, and her favorite happens to be a film I've always particularly enjoyed. "This is a true story. Although the characters are composites of real men, and time and place have been compressed, every detail of the escape is the way it really happened." In other words, "The parts that we didn't make up are true", and I'll admit to admiring the filmmakers' frankness in letting us know right from the start that parts of what we're about to watch over the course of nearly three hours is straight-up Hollywood hokum. Though all things considered, screenwriters James Clavell and W.R. Burnett didn't take nearly as many liberties with onetime POW Paul Brickhill's account of a massive break-out from a Nazi prison camp in 1944 as you might think to look at it, and a healthy chunk of the alterations were made specifically to account for the casting of Steve McQueen, who prima-donnishly demanded that his role be increased, and that a healthy portion of the big finish be devoted to him showing off his skills on a motorcycle. Also, since it is a well-known fact to movie producers that Americans don't like being told that the soldiers of any other nation are capable of heroic acts, the story is USA'd up a bit from the actual history - though the cast is undoubtedly more British than not, which is certainly gratifying. 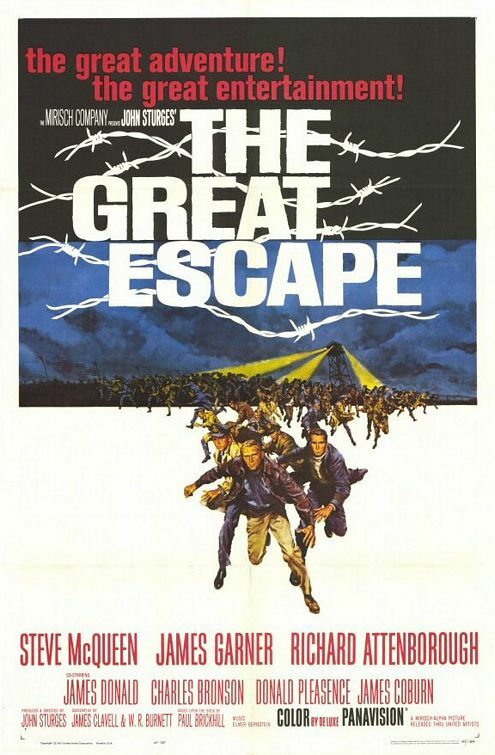 Of greater concern than any deviation 1963's The Great Escape makes from the letter of history - and maybe "concern" isn't the right word, given how little it's ever bothered me in all my years of watching this film - is its squeaky-clean Hollywoodised tone. For a film about Nazi prison camps that ends with a dedication to the fifty real-life people who died in the course of the story depicted onscreen, this is an awfully insubstantial movie: World War II has been reduced to the stuff of mere entertainment countless times since 1939, but there's something about the scope of The Great Escape, and the fact that getting this story about these man had become such a personal quest for director John Sturges, that seems somehow unusually shallow: it's tremendously difficult to connect what we're watching onscreen to reality, and not all the title cards in the world can change that fact. The stakes here a popcorn movie stakes, and when we watch somebody die, it's rattling more in the sense of "Oh, that guy, I liked that guy!" than it is in the sense of "that really happened, and it was a travesty". Which is maybe connected to the inconvenient truth that the victim of what has always struck me as the film's most heartrending death was based on a man who survived the war and passed away in 1994. I bring this all up mostly out of duty, not outrage: it is a bit disconcerting that The Great Escape so willfully trivialises the facts it allegedly memorialises, but it would take a far stricter moral scold than I to let that be a reason to hate on the film. On the contrary, I adore The Great Escape as one of the absolute pinnacles of Hollywood entertainment in the 1960s, a consummate work of nuts 'n bolts filmmaking devoted to the single end of creating something that is compulsively, endlessly watchable and re-watchable. Sturges was that kind of filmmaker: less concerned about Big Ideas or flashy stylistic excesses than doing a solid job of keeping the audience alert and excited. Insofar as he is remembered today, it's almost entirely for two films, this and the 1960 The Magnificent Seven (with his Oscar-nominated work in Bad Day at Black Rock pulling up an unfairly distant third place). At heart, both of those films are working in the same vein: excessively manly treatments of hyper-competent individuals creating and executing a plan, in which the mechanics of the plot are of paramount importance, above things like character or theme; one can't help but notice the massive tonal differences between The Magnificent Seven and its source, the Japanese classic Seven Samurai, and its those differences that make what I'll persist in calling a "John Sturges film", despite having an admittedly small sample size to work with. At any rate, it's those elements that are all over every inch of The Great Escape, making it a remarkably durable movie that never seems to slow down despite a potentially crushing 172-minute running time, so fascinated with minutiae that full hour has clicked by without our even realising it, even without anything specific or noteworthy "happening". In short, here is the plot: at a Luftwaffe-run POW camp somewhere in Germany (it was Stalag Luft III and March, 1944 in reality, but neither of those are specified in the film; indeed, it cannot possibly be March that we see depicted onscreen) a group of RAF officers plot one of the most inordinately ambitious escape attempts ever hatched. It will involve a tunnel into the nearby woods, two decoy tunnels, and the evacuation of 250 prisoners in a single night. The execution of the plan is overseen by Squadron Leader Roger Bartlett (Richard Attenborough), nicknamed "Big X", and carried out through the the efforts of an agreeably packed ensemble cast including James Garner, Donald Pleasance, James Donald, James Coburn, Charles Bronson, Hannes Messemer, and everyone's favorite icon of '60s masculine cool, that same Steve McQueen as Captain Hilts, a Yank in the RAF known as "Cooler King" for his incredible gift at being thrown into solitary confinement on a nearly constant rotation. His job in the escape planning is... sort of vague at first really, being mostly used as a distraction from the real plan, though he doesn't think of it that way. And that, above anything else I could think to name, brings us to what makes The Great Escape so goddamned interesting. McQueen wasn't as big a star as he'd ultimately become, but he was already pretty famous in 1963 (thanks in no small part to Sturges's The Magnificent Seven), and would surely have counted as the film's star power. And he appears onscreen for all of about five minutes over two scenes in the first hour of the movie. Small wonder that the actor demanded a beefed-up role, even though his motorcycle chase sequence is arguably the most ill-fitting piece of the three-hour puzzle. That pronounced lack of emphasis on McQueen is just part and parcel of the film's focus not on the acts of individuals, but on a collective team working together. The Great Escape is all about the process, not the men conceiving and executing that process, though some of the individual performances make those characters more precisely individualised - Attenborough, McQueen, Donald, and Pleasance stick out most, in roughly that order. It's basically a caper film, though even a caper film is usually more personality-driven than this; even in something as explicitly ensemble-based as Ocean's Eleven (either version) it's still, after all, Danny Ocean that gets the most attention. But Sturges does everything he can to avoid making any one character the focus of The Great Escape for more than a scene at a time, even going so far as to shoot the film almost totally without close-ups of any actor, and using medium close-ups as sparingly as possibly (and in a nice touch, almost every MCU that makes it into the film is the result of an actor stepping forward from a wider shot). It's a subtlety, of course, but a remarkably effective one; for of course, even if we're not actively counting close-ups, they serve to tell us that "this is the person who matters" on a subliminal level; take that away, and then double the effect with a CinemaScope frame that makes it possible to stuff even more characters into ever shot, and the film constantly reinforces the idea that no one person is more important than the action. Tellingly, the most prominent close-up in the movie isn't even of a person: it's of a spade breaking the ground from below, as the prisoners are about to complete their tunnel to freedom. The intense focus on the process earned The Great Escape some negative notices upon its release, but I suspect that's the same reason it has worn so incredibly well: if it's not both the best-loved prison break movie and the best-loved WWII POW camp movie ever made, it's surely in the absolute top tier of both of those subgenres. And this is, I think, precisely because its focus is less on personal stories than on action. This is an absurdly fun movie to watch: it says very little about the human condition - we learn almost nothing about any of the characters that doesn't become specifically important for the plot later on - but it doesn't ever sag for long enough to let you notice that fact. Sturges's genius, and I do not mind using that word in praise of a filmmaker with little obvious personality as a director, is that he presents each detail of the plan with all the excitement of a major setpiece: he understands the human tendency towards curiosity in how things work and rewards it by lingering over every step in the process. There's not a single moment of action for the first two hours of the movie, but it is as driving and thrilling as any war film could be; and just to make sure that it never lags, along comes a ringer in the form of composer Elmer Bernstein with the best score of his career, a rollicking, jingoistic collection of iconic marches and leitmotifs (the arch-backed strings that great the Nazis whenever they come onscreen is clearly echoed in John Williams's Indiana Jones scores) that give the film a bouncy momentum that carries us through the very few moments when Sturges and the screenwriters can't keep us enthralled by the ingenuity of the protagonist's schemes. It is, when all is said and done, a mechanical film: but god, what a beautiful machine!